A charming game online. The Kung Fu Statesman was loaded very quickly. Nice graphics! 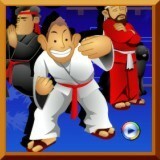 The Kung Fu Statesman is an awesome game! First, I had difficulties. But after several attempts, everything went very well.